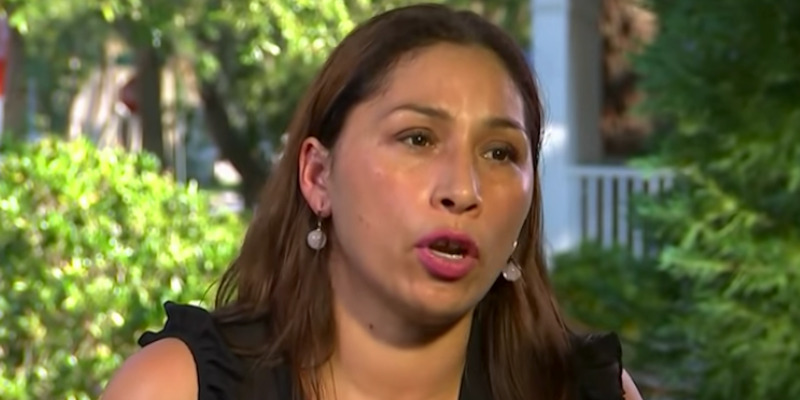 YouTubeAlejandra Juarez, the wife of a Iraq War combat veteran, was deported on Friday. After being notified of her deportation date by Immigration and Customs Enforcement (ICE) and with few options left, Alejandra recently wrote a letter to President Donald Trump pleading with him to let her stay in the US. She hoped her husband’s war record might persuade the president to intervene. But Alejandra’s calls for leniency have seemingly gone unanswered and she boarded a plane at Orlando International Airport on Friday morning bound for Mexico, where she’s originally from. Alejandra’s husband, Sgt. Cuauhtemoc “Temo” Juarez, is a former Marine turned National Guardsman who fought in Iraq. She says the decision to deport her is disrespectful to her husband’s service and status as a veteran. “They’re punishing him for something that I did a long time ago. His only mistake was marrying me,” Alejandra told the Orlando Sentinel. Temo Juarez is a Trump supporter and he’s expressed regret about this in light of his wife’s situation. The Juarez’s eldest daughter will remain in the US with her father, but Estela will soon join her mother in Mexico given Temo Juarez frequently travels for work. When Alejandra first attempted to enter the US in 1998 she was caught and deported. At the time, she signed a document that immigration authorities said would help her avoid spending time behind bars, and has claimed she didn’t realise it would also prohibit her from pursuing a permanent resident card, visa, or a path to naturalized citizenship in the future. After being deported, Alejandra spent a short time in Mexico before crossing the border again and she’s lived in the US ever since. For many years, unauthorised immigrants who were spouses of members of the US military were not prioritised for deportation and in some cases had options to legally stay in the country. Hence, when Alejandra’s illegal status was revealed in 2013, immigration authorities simply told her to check in twice a year. But the relative leniency military spouses and dependents experienced in the past has rapidly dissipated under the Trump administration’s “zero tolerance” policy towards unauthorised immigrants in the US. Alejandra has made attempts to stay in the US based on an option open to family of current or former service members known as “parole in place,” but her most recent application was rejected. The document she signed when she was first caught in 1998 more or less barred her from being eligible. As Alejandra departed the US on Friday, she and her family were joined by Rep. Darren Soto, a Democrat who represents the Florida district where the Juarez’s live. Soto in recent months sponsored legislation aimed at protecting military spouses from deportation, which was inspired in part by Alejandra’s situation. Alejandra would not say where she’s going in Mexico, which seemed to be linked to fears over her safety. She’s originally from Mexico City, but fled because of a death threat and a dysfunctional family.